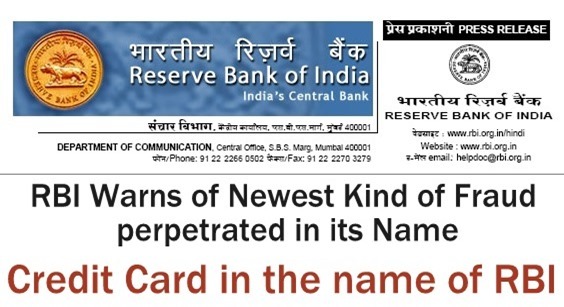 Reserve Bank of India has issued a fresh circular, warning general public against credit cards and bank accounts issued in it’s own name. In the notification issued by RBI, it has explained the manner in which this new form of fraud is taking place. Fraudsters will contact its victim, and provide them with a new credit card issued by RBI. The card will first allow the victim to withdraw a small amount from an attached bank account. Once the victims taste money, confidence is developed and they start trusting that bank account. After some days, the victims are again contacted by these fraudsters, and asked to deposit a large amount of money into that same RBI issued bank account. In the notification, RBI has again repeated that customers should be alert and informed against anyone who poses as an RBI official and announces sudden lottery or jackpot and asks for a certain sum to be deposited in their bank accounts. Customers should never share their bank account details or deposit sum in such fake bank accounts. Additionally, offers of online transaction at fake RBI websites and employment offers at RBI should also be dealt strictly with. RBI doesn’t allow any official to promote or sell such lucrative offers, and fraudsters are using RBI’s name illegally. In case you are contacted by such fraud officials via email or phone, or you have already deposited money with them, then don’t wait and hide the incident. RBI has categorically said that such incidences should be immediately reported to Cyber Crime Branch of Police or local authorities. RBI has also issued a list of such nodal agencies where customers can register their complaints. In case the fraudsters are based out of India, and you have mistakenly remitted money in their fake bank accounts, then don’t get discouraged. RBI in it’s circular has clearly stated that action can be taken against such criminals using Foreign Exchange Management Act, 1999; Anti Money Laundering (AML) laws and violation of Know Your Customer (KYC) norms.